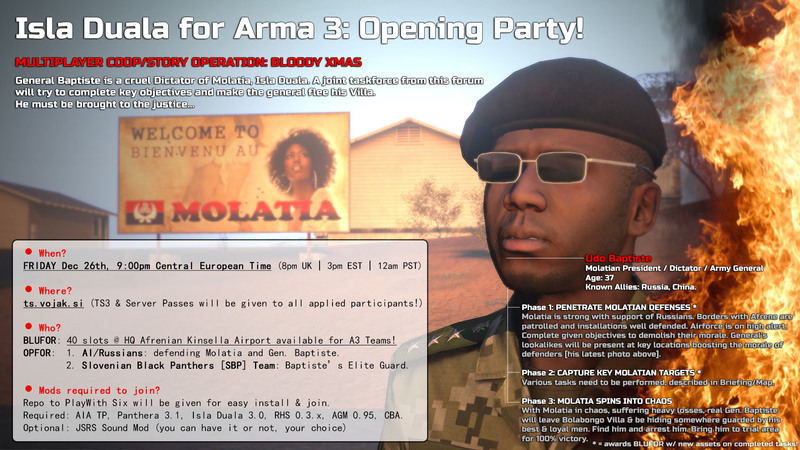 [Fri, Dec 26th] Isla Duala for A3 Opening Party: Bloody Xmas Multiplayer Op! This Christmas Isla Duala, one of most popular A2 maps, got released [in updated form] to the mil-sim lovers of Arma 3. Sadly, they don't see much snow over there. BLUFOR: 40 slots @ HQ Afrenian Kinsella Airport available for A3 Teams! OPFOR: 1. AI/Russians: defending Molatia and Gen. Baptiste. 2. Slovenian Black Panthers [sBP] Team: Baptisteâ€™s Elite Guard. Repo to PlayWith Six will be given for easy install & join. Required are: AIA TP, Panthera 3.1, Isla Duala 3.0, RHS 0.3.x, AGM 0.95, CBA. All mails without proper subject name stated above will be ignored. If you have any questions send me a PM via this board. pws://panther.vojak.si/A3BX/config.yml (sixupdater) <-- this "url" is supported by Internet Explorer/Chrome, just click Allow and it will set up your Play WithSix client. Added signed up players to the list. ice breaker, isnt 0 pm = 12 am?? im confuxed. my team and i would like to sign up but we need to get everyone on board with the time. Oops sorry Lordprimate, its 12AM yes, my bad. Let the know and send me an email. Zio Sam: no TFAR for this event. We'll do couple more if there will be enough interest. I want to join but its like 2 am where I am! I want to see a live stream or video of the game session though. Wish I could fit this into my schedule. Best of luck to you. Unluckily 26 december in Italy it's very difficult to find players(only 3 ansewred me atm),and the absence of TFAR is another factor,the modset otherwise is perfect with AGM,RHS and your map. If those kinds of events would be arranged in future i'm pretty sure we can bring some italians players as well. The best of luck for this event and for the ones that will come.Thank you so much for bringing back Duala! Dammit just found out about this event today, It is a good time of day for me in Australia (7pm) but I am going to see the new hobbit movie at 9pm that day. Is it possible for me to just come on for an hour and a half before i leave for movies? I have a couple people who would like to take part, I'll send out the email shortly. PenguinInATuxedo: sure why not. Mission is in 3 phases with many objectives. Hopefully island will show up today on a repolist of Play WithSix. 26 hours remaining until the start of the event! We have 12 players signed up so far, with only [sBP] team present and individual players on the opposing side. I hope one or two teams will apply to counter the Molatian force. password = will be sent to all signed up players via mail and BIF PM (if email reply doesn't go through). I hope you marked me down in that 12, I wouldn't wanna miss out on password. Nicknames are listed in the first post? Check it. I don't see my name I assumed you were just keeping a list of people else where. And it this going to be using the latest version of AGM with the med system rewrite? some people told me that the new med system is still all buggy. Well, see the instructions on how to sign up (first post). I didn't get an email from you with subject "A3BX" yet? Email sent, few guys from the Unity Security Force will be there to enjoy an amazing new map. 9 players (even two teams!) signed up in the last hour. 19 hours to go. What's the possibility of getting into Air Support squad, if it'll be deemed enough players to justify a pilot or two? Decide before you fire the mission up (I might get another member to pilot and I am one myself as well), I'll make sure to be on TS some time before the op. No problems. We'll discuss it on the teamspeak right before the start. Great, so far 28-30 people on the list (see 1st post). You'll get your emails around 1800 CET. Hope you have addons already set up (repo PWS) or by hand (see pic in the 1st post to install all needed). I certainly recommend Play WithSix. We are all ready for Combat!